McDonald’s Style Chicken Nuggets Recipe. 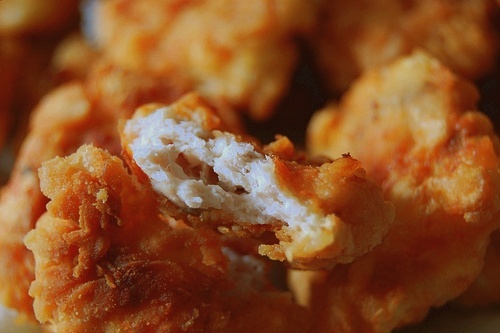 Try your own homemade chicken nuggets recipe! This recipe was shared by a chef and a friend of mine last week, which i have tried it myself. If you are curious on how McDonald’s Chicken Nuggets are prepared, try follw these interesting steps below. 4 chicken breast filets, each cut into 6-7 bite sized pieces. (Dry the chicken bite sized pieces by patting with kitchen towel). Beat the egg and then combine it with 1 cup water in a small, shallow bowl. Stir. Combine the flour, salt, Msg, pepper, onion powder and garlic powder in a one gallon size zip lock bag. Pound each of the breast filets with a mallet until about 1/4-inch thick. Trim each breast filet into bite sized pieces. Coat each piece with the flour mixture by shaking in the zip lock bag. Remove and dredge each nugget in the egg mixture, coating well. Then return each nugget to the flour/seasoning mixture. Shake to coat. Put nuggets, bag and all, in the freezer for at least an hour. Cover and refrigerate remaining egg mixture. After freezing, repeat the "coating" process. Drain on paper towels 3-5 minutes. Place deep-fried nuggets on preheated cookie sheet in oven and bake another 5-7 minutes. Serve with your favorite McDonald’s dipping sauce. hey tx! great content, great recipe blog. My little Sally love chicken nuggets but I don’t know how to make those. Thanks for your recipe. I can make it at home for her. Do some research, MSG is not bad for you. As a matter of fact, MSG allows you to use less regular salt without sacrificing flavor.